You can very easily put yourself at risk of developing a physical injury or a psychological barrier if you don’t spend adequate time developing underwater composure before progressing into other kayak skills. Underwater composure is how calm someone can be underwater in a variety of positions and conditions. I cannot stress enough the importance of developing composure underwater before beginning the process of learning how to roll. I’ve seen it time and time again where someone is rushed through a rolling progression by a friend, or sometimes an instructor, and after hitting a few successful rolls their friend gives them some space or tells them they’re “good to go”. After paddling around for a bit the new kayaker flips over, misses their first roll, their instincts take over their mind, they pull with all their might on the paddle, their head comes up, and they do a frantic wet exit. A situation like this can really do a number on a new kayakers’ confidence and imprint a pretty negative memory about flipping over and trying to roll. 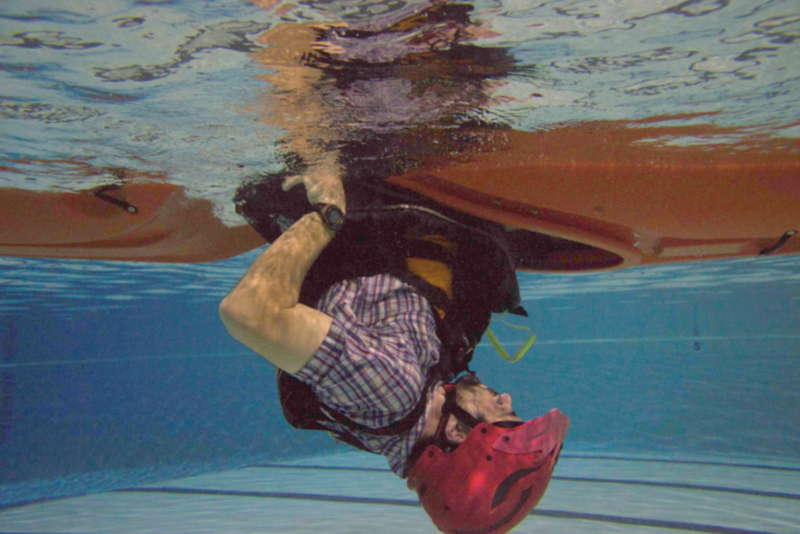 Below I’ve outlined some “underwater composure” exercises that I’ve done with countless students over the years including a lot of students with hyper-anxiety about being upside in a kayak. This this an array of exercises that I selected to help assess and/or develop underwater composure. I usually jump straight into these activities after we carry our kayaks over to the water’s edge and before I jump into the steps of a “wet exit”. Get in and float: This is an opportunity to just float in the water and to feel how the life jacket floats you. It’s also an opportunity to make any adjustments on gear that may have become loose in the water. After floating for a bit try putting your face down in the water and feel the water surround your face and ears, blow some bubbles under there if you want… Then make sure you try to swim around too, freestyle and side stroke; it’s a bit different with all that gear on. Somersaults anyone: If you’re up to it, doing forward and reverse somersaults in the water can be a great experience to really feel the water in a somewhat disorienting movement. During this experience you are bound to get water in your nose if you aren’t wearing nose clips, and that’s a good thing. If you don’t have nose clips you might as well begin getting used to a little water in the nose. This experience will either encourage you to purchase a pair of nose clips or help you realize that you don’t need any. If somersaults aren’t your thing, try some “log rolls” in the water. Again, we’re just going through some disorienting movements in the water and focusing on feeling the water around us. Now take a few minutes to dry off and then hop in that kayak and practice some dry land “wet exits” until you feel like you’ve got the steps dialed. 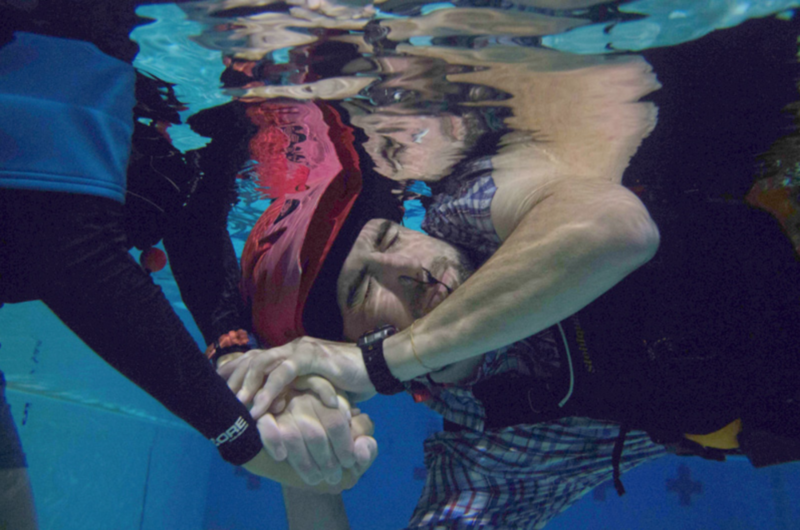 When you’re ready, slide into the water and connect with whomever you’re working with, ideally a trained/certified instructor, and let them know you’re ready to practice some wet exits. You should practice wet exits a lot! This is a tremendously valuable skill and is your first self rescue option. You don’t have to rely on anyone to do a wet exit and that is really empowering. After practicing a lot of wet exits, hop back into your kayak and slide back out into the water with the instructor or friend you’ve been working with for some more kayak specific underwater composure exercises!